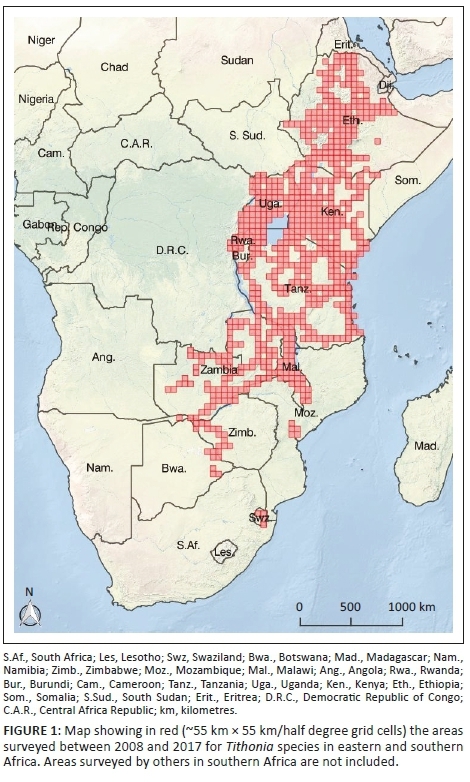 METHOD: Roadside surveys, and other sources of information, were used to determine the distribution of invasive Tithonia species in eastern and southern Africa. Household interviews were conducted to gauge perceptions and understand the impacts of T. diversifolia on local livelihoods in Zambia's Copperbelt province. 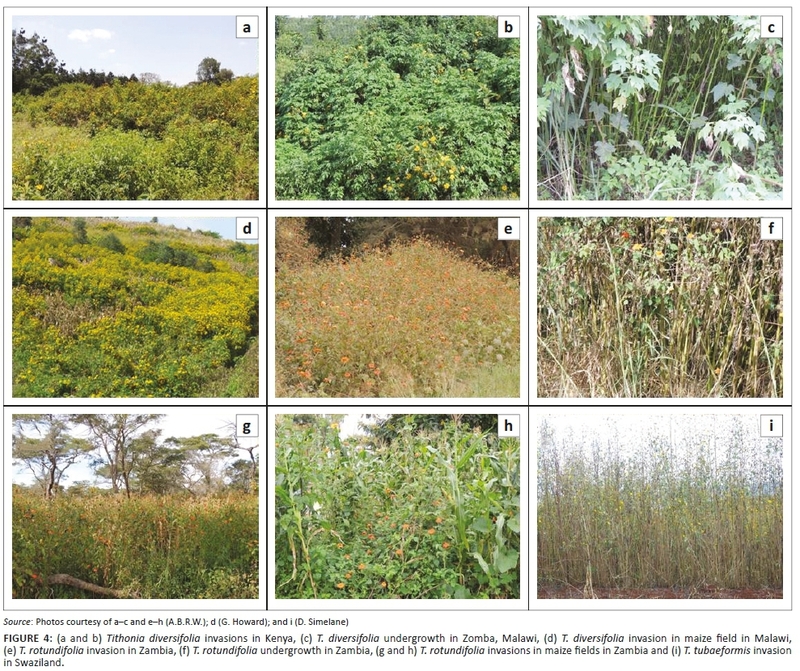 CONCLUSION: Invasive Tithonia species are widespread and spreading throughout much of Africa. Livelihood and biodiversity costs have not been considered by those actively promoting the use and further dissemination of T. diversifolia. We therefore recommend that detailed cost-benefit studies should be undertaken to support informed decisions on the future management of these species. Invasive alien species pose significant threats to biodiversity and human well-being, especially where rural communities are dependent on natural resources (Shackleton et al. 2007; Vaz et al. 2017; Vilá et al. 2010). Many invasive species were introduced intentionally as ornamentals, for restoration in degraded landscapes, as agro-forestry species or as crops (Rejmánek & Richardson 2013). Many of these species are beneficial, contributing to rural livelihoods by providing a wide range of products (Kull et al. 2011; Shackleton et al. 2007). Assessing people's perceptions of these invasive species can provide insights into their negative impacts, but also into attitudes and perceptions regarding their management (Mwangi & Swallow 2008; Rai et al. 2012). This information can inform decisions on whether or not to attempt control, especially where the target species has both benefits and costs ('conflict species') (see Novoa et al. 2016; Shackleton, Le Maitre & Richardson 2015; Van Wilgen & Richardson 2014). Of the 11 species in the genus Tithonia, all native to North and Central America (Arias, Martin & Gimenez 1982), three (T. diversifolia [Hemsl.] A.Gray [Mexican sunflower]; T. rotundifolia [Mill.] S.F.Blake [red sunflower]; and T. tubaeformis [Jacq.] Cass [wild Mexican sunflower]) have become invasive in Africa and elsewhere. Tithonia diversifolia, a perennial shrub, producing seeds throughout the year, with the capacity to grow clonally, leading to the development of dense stands (Muoghalu & Chuba 2005), is invasive in more than 35 countries (> 20 in Africa, CABI 2017). Invasions are rapid, facilitated by the production of between 80 000 and 160 000 wind-dispersed seeds/m2 annually (CABI 2017). It was probably intentionally introduced to many countries as an ornamental and hedge plant, but was later promoted for soil improvement, livestock fodder and as a 'green manure' (Jama et al. 2000), which has not only contributed to its spread, but has also led to conflicts regarding its benefits and costs. Tithonia rotundifolia, an annual producing fewer seeds, which are heavier and larger than those of T. diversifolia, contributing to rapid seedling growth and facilitating establishment in resource-poor environments (Muoghalu & Chuba 2005), has the widest natural range of all Tithonia species in Central America (Blake 1921), extending from southern Mexico to Panama, mainly in arid zones below 1000 m (Tovar-Sánchez et al. 2012). However, little is known about the distribution of T. rotundifolia outside of its natural range. Tithonia tubaeformis occurs naturally in temperate zones 1000 m above sea level (Tovar-Sánchez et al. 2012). It is invasive in southern Africa (Henderson 2007) and Argentina (Larenas-Parada et al. 2004). 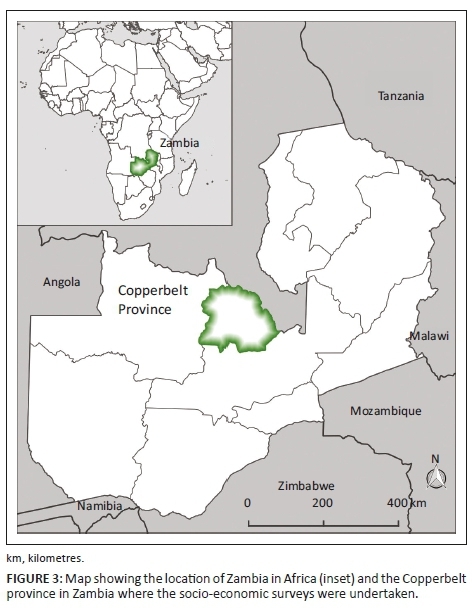 Zambia's Copperbelt province was selected as a suitable region to undertake the socio-economic surveys because T. diversifolia is abundant, and there were previous reports that farmers had abandoned their lands in Zambia as a result of invasions. The province lies on the eastern Central African Plateau, consisting of gently undulating terrain ranging in elevations from 900 m to 1500 m. The province has a mild climate with an average annual temperature of 20°C and receives approximately 1288 mm of rainfall per year. In 2010, the Copperbelt province had a population of 2 million people, about 15% of the total Zambian population (Central Statistical Office 2012). In that year, the average household size was 5.3 with a literacy rate of 83%, which was higher than the national average of 70% (Central Statistical Office 2012). The majority of people in the province are employed in the mining and energy sectors, with < 20% of the provincial population being small-scale farmers. The total area planted to crops, mainly maize, tobacco, groundnuts and potatoes was ~120 000 ha in 2014 (6.5% of the total area cultivated in Zambia). The date of first introduction of Tithonia species was estimated from literature surveys, herbarium specimens and personal communication with local botanists. The current presence and status of T. diversifolia, T. rotundifolia and T. tubaeformis invasions was recorded in eastern and southern Africa (Ethiopia, Kenya, Malawi, Rwanda, Swaziland, Tanzania, Uganda and Zambia) in roadside surveys between 2008 and 2017 (Figure 1), using similar methods to those of Henderson (2007), Rejmánek et al. (2016), Shackleton et al. (2017b, 2017c, 2017d), Witt and Luke (2017) and Witt et al. (2017). During this time, we drove considerable distances, covering tens of thousands of kilometres (Figure 1). The location of Tithonia species was recorded using a handheld GPS device and categorised as present, naturalised or invasive (as defined by Pyšek et al. 2004). 'Present' indicated individuals being grown as ornamentals, but not spreading; 'naturalised' denoted self-perpetuating populations; and 'invasive' denoted widespread occurrence within a defined area or local abundance with small, but very dense stands. Additional information on distribution was obtained from the Southern African Plant Invaders Atlas (Henderson 1998); the websites Flora of Mozambique (2017), Flora of Zambia (2017) and Flora of Zimbabwe (2017); herbarium records from Botswana, Kenya, Mozambique, Uganda and Zimbabwe; personal observations by national and local botanists; and the general literature (Rejmánek et al. 2016). 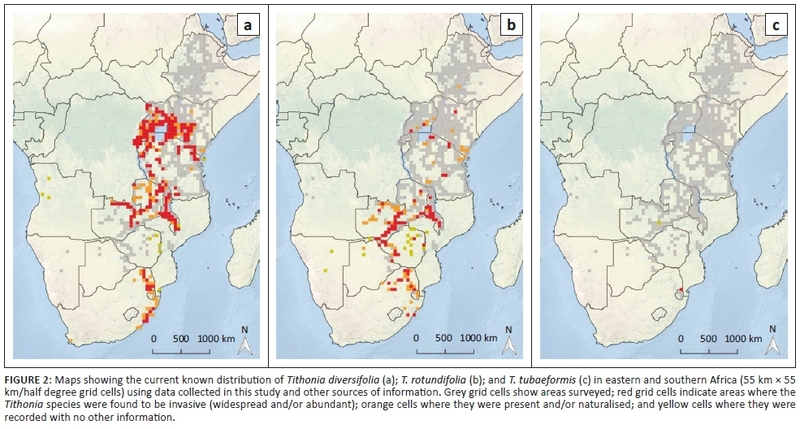 The large-scale distribution of the three Tithonia species was then mapped at the resolution of half degree grid cells (~55 km × 55 km) (Figure 2), providing a large-scale approximation of the presence of Tithonia species across the region. The socio-economic effects and perceptions of T. diversifolia invasions were assessed by interviewing 166 individuals, in their own language, at randomly selected households using semi-structured questionnaires, in villages and towns in Copperbelt province, Zambia, where T. diversifolia occurs (Figure 3). Tithonia diversifolia was selected as a case study because it is the most widespread and abundant Tithonia species in Africa, is widely promoted as a green manure and as such is considered to be a 'conflict' species. Questionnaires are increasingly used to provide quantitative data on the perceptions and effects of invasive alien species on society (see Mwangi & Swallow 2008; Shackleton et al. 2015, 2017b, 2017c, 2017d). 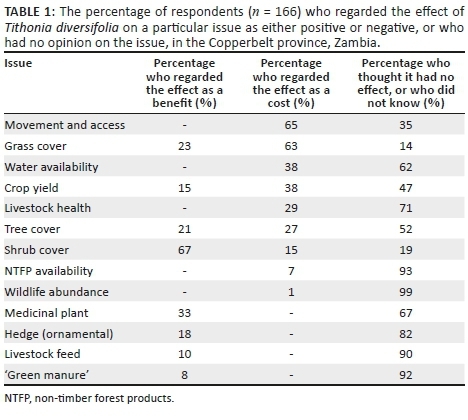 Respondents identified a variety of benefits and costs associated with T. diversifolia invasions (Table 1). On average, most respondents (62%) could not say whether a particular aspect was positively or negatively affected, or unaffected, by T. diversifolia, but for the 38% who did express an opinion, there were more who considered that the net outcome was negative (29%) than positive (9%). In general, the costs were mentioned more frequently and by a higher proportion of respondents (Table 1). Key negative aspects raised by respondents included impacts on grass and tree cover, mobility or access, water availability, crop yield and animal health (Table 2). To a lesser extent T. diversifolia was also said to reduce the abundance of medicinal and other valuable plant species. More than 40% of respondents said that T. diversifolia was the most problematic weed in croplands (followed by several other alien species; Table 2). Of the respondents who mentioned impacts on crop yields, 23% said that it can reduce crop yields by 75%, and around 10% mentioned losses of 25% - 50% if not managed in fields. Tithonia diversifolia was also considered the most problematic weed in pastures, followed by Argemone mexicana L. (Papaveraceae), Datura stramonium L. (Solanaceae), and Lantana camara L. (Verbenaceae) (Table 3). Most of the problematic weed species identified by respondents in rangelands and croplands are invasive alien species as opposed to native weed species (Table 3). Despite divergent views on the benefits and costs of T. diversifolia, the majority of respondents actively managed T. diversifolia to reduce its impacts. In pasturelands, 89% of the respondents attempted to control T. diversifolia primarily though slashing (Table 4). The majority of respondents (79%) also removed it from their croplands to reduce its potential negative impacts on crops (Table 4). Most (61%) respondents spent 1 day per year clearing T. diversifolia, while 18% reported spending around 5 days per year on this activity. Of those who actively cleared T. diversifolia, 58% paid for help at a cost of $12 - $24 per ha. Of those respondents using herbicides, 34% spent $10 - $50 per year and 16% paid more than $50. Many of those interviewed (35%) said that crop losses would be higher if T. diversifolia was not controlled. Besides propagule pressure, the characteristics of invaded ecosystems, recipient communities and invading species are important factors to consider (Catford, Jansson & Nilsson 2009). For example, T. diversifolia rarely co-occurs with T. rotundifolia in southern Africa. Tithonia rotundifolia is most invasive in parts of South Africa that have a climatic classification of temperate - dry winter, warm summer (Peel et al. 2007) and where T. diversifolia is largely absent. Areas where T. rotundifolia is common often experience cold winters, with frequent frost. Soil nutrient levels may also influence distribution patterns. For example, T. rotundifolia produces heavier and larger seeds than T. diversifolia and is better adapted to nutrient poor soils (Muoghalu & Chuba 2005), which may explain its dominance in large parts of Zambia, Malawi and Zimbabwe that are nutrient poor (Malmer 2007). We therefore postulate that T. rotundifolia could become established more widely in semi-arid countries such as Botswana and Namibia. Tithonia diversifolia invades and competes with agricultural crops and reduces yields (Ilori et al. 2010, Figure 4), as highlighted by respondents in this study (Tables 1 and 4). This is in agreement with Akobundu (1987) and Imeokpara and Okusanya (1994), who found T. diversifolia to be one of the most 'underestimated' problems in Nigerian agriculture, especially in rice and maize fields. According to Chukwuka, Ogunyemi and Fawole (2007), most farmers in invaded areas in Nigeria have abandoned their farmlands because of invasions by T. diversifolia. Because T. diversifolia is a prolific seeder, it can rapidly colonise crop fields and increase labour costs (Jama et al. 2000). In western Kenya, landholders cut back Mexican sunflower hedges to reduce competition with crops in neighbouring fields (Jama et al. 2000). We are therefore of the opinion that it would be cheaper, in most cases, to apply inorganic fertilisers, considering that commercial fertilisers were available from the Kenyan government, in 2014, at costs ranging from $15 to $20 for 50 kg of fertiliser (PSCU 2014). As farmers' income levels rise, fertilisers may become a more attractive option. The majority of respondents were of the opinion that the costs of T. diversifolia outweigh any benefits, which suggests that the species should be managed (Tables 1 and 4). Management will have almost no negative impacts on livelihoods and could have substantial social and environmental benefits (Table 4). There has been very little effort, outside of South Africa, to control T. diversifolia, because of limited information about its negative impacts, or because active promotion avoids information about negative impacts (Sanchez 1999). For example, we identified many more publications on the benefits of T. diversifolia in Africa (Adoyo et al. 1997; Anette 1996; Jiri & Waddington 1998; Nginja et al. 1998; Otuma et al. 1998; Roothaert & Patterson 1997; Tongma, Kobayashi & Usui 1997, 1998) than on negative impacts (Agboola & Muoghalu 2015; Oludare & Muoghalu 2014). 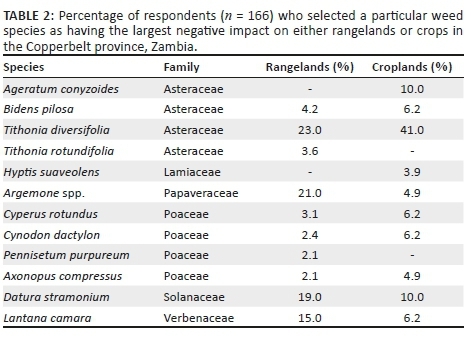 However, based on people's responses in Zambia, T. diversifolia does have negative impacts (Table 1) and is considered to be the weed with the biggest negative impacts by most respondents in the region (Table 4). As Tithonia species spread and densify, management costs will increase steeply, leading to the possible abandonment of productive cropland when the cost of control becomes prohibitive. Unlike T. diversifolia, T. rotundifolia is not regarded as a 'conflict species'. As such the release of the damaging and host-specific biocontrol agents Zygogramma signatipennis Stål and Z. piceicollis Stål (Chrysomelidae: Chrysomelinae) in South Africa should be supported throughout the continent (Simelane, Mawela & Fourie 2011). Assuming that the negative impacts of T. rotundifolia are similar to those of T. diversifolia, the establishment of these agents should contribute to biodiversity conservation and improve crop yields. Tithonia tubaeformis is not considered as a target for biological control at this stage (D.O. Simelane [ARC-PPRI], pers. comm., 13 April 2017). The use of T. diversifolia biomass as a green manure has contributed to increased crop yields, but overcoming food insecurity by introducing species that have negative impacts will not contribute to human welfare in the long term (Witt 2017). Individuals may benefit from the presence of T. diversifolia, while livelihood options for others may be considerably reduced. This anomaly can only be resolved by 'developing holistic solutions that consider the potential implications of all interventions, in all sectors, and in subsequent years' (Witt 2017). An analysis of whether the benefits from the use of T. diversifolia outweigh the costs would be needed to inform a decision on the most appropriate management approach. This has been done for Acacia mearnsii De Wild. (Fabaceae) in South Africa, where it is an important commercial tree but also an aggressive invader (De Wit, Crookes & Van Wilgen 2001). The results of the analysis indicated that a 'do nothing' scenario (with no attempts made to control spread) is not sustainable and that the most attractive option would be to combine physical clearing with biological control. A similar cost-benefit study on Prosopis in South Africa (Wise et al. 2012) has been useful for policy development. The net value of introduced alien plant species is typically not considered when introductions are made, and the decision to promote a particular species for its putative benefits, without considering the costs, has led to many problematic outcomes in the past. When the holistic picture is considered, it often becomes apparent that the harm done by invasive species exceeds any benefits and that a focus on aggressive control would deliver the best outcomes (De Wit et al. 2001; Nordblum et al. 2001; Wise et al. 2012).